Huawei P30 Pro, the upcoming flagship smartphone by Chinese smartphone manufacturer Huawei, is set to arrive in India soon. Being a P-series smartphone, known for imaging capabilities, the P30 Pro boasts a quad-camera set-up on the back, featuring the company’s first periscope telephoto lens capable of up to 5x optical zoom. The phone's first impressions are in favour of it being more than just a camera phone. Like its predecessor, the Huawei P20 Pro (review), the phone’s gradient reflective design on the back is mesmerising. The new colour options, especially ‘breathing crystal’ white, look elegant – giving the phone a distinct identity. The phone’s curved OLED screen on the front is reminiscent of the Mate 20 Pro, but without a huge notch on the top. The tiny waterdrop notch, curved screen, and in-display fingerprint sensor bring the phone closer to being a bezel-less screen smartphone. Unlike the P20 Pro, the phone’s front looks uniform and has no design obstructions – it does not even have the earpiece opening, and it uses the electromagnetic sound levitation that projects sound from the vibrations in the display to ear. 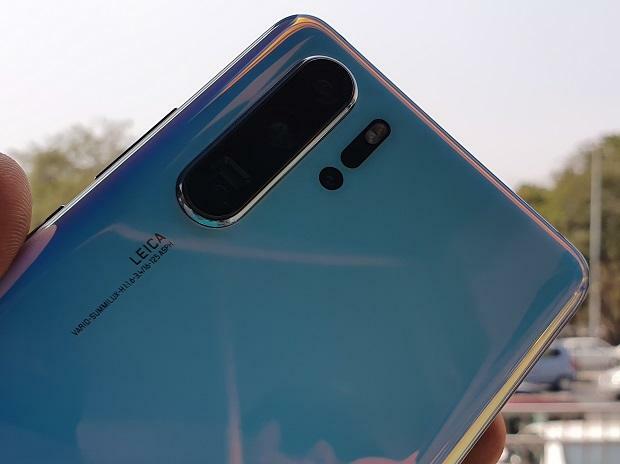 Design and aesthetics aside, the key differentiator for the Huawei P30 Pro is its camera hardware. In quick hands-on experience, the rear camera module is impressive as it locks the auto focus quickly, capturing a detailed ultra-wide angle shot, and by recognising scenes rapidly – even when you shift focus. The module's ability to reach up to 5x optical zoom, 10x lossless hybrid zoom, and 50x digital zoom is the phone's best feature. The phone appears to have at least something for everyone. The phone would now be tested for its hardware performance, battery life, features, camera performance, multimedia performance, user experience, and more. A detailed review followed by a verdict would be published after the phone’s launch in India on April 9. Stay tuned!